Today, when you order "The Continental by Cameron Francis", you'll instantly be emailed a Penguin Magic gift certificate. You can spend it on anything you like at Penguin, just like cash. Just complete your order as normal, and within seconds you'll get an email with your gift certificate. From January 2010 to February 2011, Cameron had 12 tricks published in the British IBM magazine "The Budget". The column was called "The Continental" and thanks to editor Stephen Tucker, Cameron is now able to offer you all 12 effects in one 28 page PDF. The column includes tricks for close up and stand up work using cards, coins, bills, matchbooks, business cards, Sharpies, steno pads and drawings. While some of the material has been published before, five of the tricks have never been previously published and most of the previously published material has been updated with new handlings. Daley's Last Sandwich -- Daley's Last Trick with a killer ending. Change -- A great bill switch routine that's loaded with magic and laughs. Thanks, Meester -- A killer transpo of Kings and Jokers with an unbelievable ending. Inward Bound -- A completely examinable matches across effect! Posse -- Jokers capture a card, transform into its mates and then make a surprise reappearance. The Magic Coin -- A different spin one the Wild Coin effect. MCM Smackdown -- A stunning card effect where a mentalist, a card sharp and a magician duke it out with surprising results! Money Business -- A streamlined handling of an effect from the Attack of the Copper Silver Coin dvd. Sticky Greatness -- Sure to be the talk of the booklet. 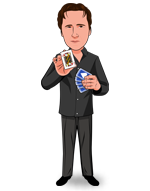 A stickman magician jumps from a piece of paper to a freely selected card and back. A great opener! "The Continental" is a 28 page photo illustrated PDF.